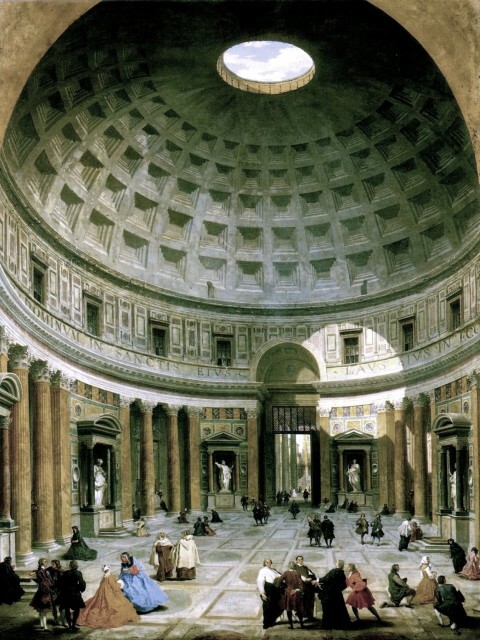 2000 Year Old Example of Integrated Architectural and Engineering Design | 15000 Inc. Integrated Design is NOT a new concept. Here is concrete proof (pun intended) that Architects and Engineers worked hand in hand long before the advent of building codes, AutoCad and integrated project delivery! The Pantheon, a “Temple for all the Gods”, is located in Rome and was completed around 14 AD. It is the oldest continuously inhabited building in the world. It remains an architectural and engineering monument without equal, 2000 years after it’s construction. Th Pantheon is the largest concrete dome that has ever been built. It was constructed with super-strong concrete with varying aggregates as you get closer to the peak. Today the use of admixtures to create varying concrete characteristics is an evolving science. The story of the Pantheon showcases how the architecture and engineering worked together to create that which was thought to be impossible. Architects and engineers working together to achieve the impossible… it’s a great story and, a great lesson.